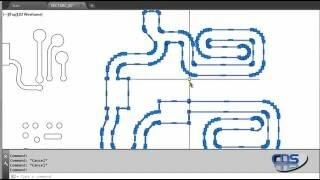 This powerful application enables users to smooth out vectorized artwork into full-fledged arcs. It can also create circles when needed. The user has total control over the process and can specify an absolute value for maximum distance between the existing vector and new arc polylines, and also specify a relative to radius value. Just the thing one needs when confronted with a whole bunch of vector segmented arcs and need a quick way to convert all of them into true arcs or circles all in one go! This app is worth much more than it sells for.